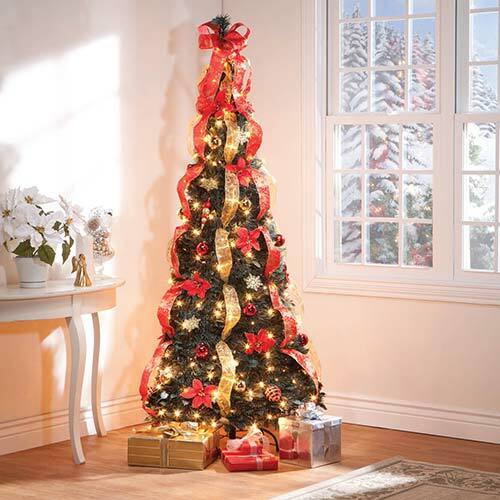 Decorate for Christmas with ease this year with the help of the already lit and decorated tree from Miles Kimball! Do you love having your home decorated for Christmas, but hate the tedious task of wrapping lights on the tree and hanging ornaments? Even if you buy a simple pre-lit Christmas tree, you still have to be bothered with putting all those dreadful hooks on each individual ornament. This instant Christmas tree is just for you! It is pop-up and collapsible, and already comes lit and decorated. It even already has a topper, completely taking away the stress of hooks and light cords! Decorate for Christmas in no time this year with this instant tree. It can be delivered to your door, unwrapped, and assembled in minutes – creating an instant Christmas atmosphere to spread some holiday spirit! Simply place in the stand, expand the tree, plug in the power cord, and you’re all set for Christmas! Not to mention, the cleanup after Christmas is as effortless as it is going up. Simply unplug, collapse the tree, removed the stand, and pack away for next year. Skip the long tasks of taking off all of the ornaments, unraveling the lights, and packing things away. Instead, do it in seconds and spend that extra time you saved with your family. Order now for a fast, stress-free holiday setup in seconds!